A new study, published today in Nature Climate Change, provides one of the most comprehensive assessments yet of the simultaneous occurrence of multiple climate hazards strengthened by increasing greenhouse gas emissions and their effect on humanity. According to lead author Dr. Camilo Mora of the University of Hawaii, the research reveals that society faces a much larger threat from climate change than previous studies have suggested. According to Dr. Mora, analysis of thousands of peer reviewed scientific papers reveals 467 ways in which human health, food, water, economy, infrastructure, and security have been impacted by multiple climatic changes including: warming, drought, heat-waves, wildfires, precipitation, floods, storms, sea level rise and changes in land cover and ocean chemistry. Until now, with few exceptions, each climate hazard due to greenhouse gas emissions and their intensification has been studied independently from one another. However, a focus on individual hazards may mask the impacts of larger-scale threats, resulting in incomplete assessments of the consequences of climate change on humanity. 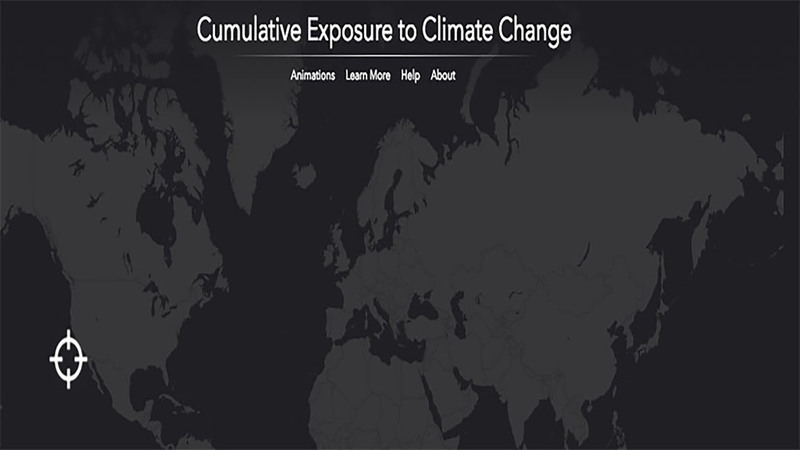 At Esri, we have created an interactive app in partnership with Dr. Mora that models the cumulative number of climate hazards likely to occur under different emissions scenarios for any place on Earth through 2100. The interactive app visualizes the index of 11 hazards, including warming, drought, heatwaves, fires, precipitation, floods, storms, water scarcity, sea level rise, and changes in natural land cover and ocean chemistry. Users can see how severely locations around the world will be affected by these cumulative hazards under different global mitigation scenarios. A slider lets you visualize how cumulative climate impacts change by year. You can drag the slider to change the time range between 1965 and 2095, allowing you to visualize where impacts will be greatest based on the year. You can also alter the level of carbon mitigation. By default, the app loads in with a strong mitigation model based on RCP 2.6. By clicking the experiments drop-down, you can visualize how impacts change under a moderate, and a business-as-usual approach that maintains current policies. Esri is proud to collaborate with Dr. Camilo Mora and his colleagues to bring this wide-ranging view of the potential hazards posed by climate change, and how it continues to literally redraw lines on the map. By clearly visualizing the threats that our world’s ecosystem faces at every level, these maps and data hammer home how location intelligence can help us understand what is at stake in making decisions, even at a global scale.